Whenever I access my website using it's plain domain name (http://phunsites.net), I'd end up with a password prompt from my DSL router. But it turned there wasn't - why should it anyway? ; <<>> DiG 9.6.0-APPLE-P2 <<>> A www.phunsites.net. phunsites.net. 60583	IN	NS	ns1.genotec.ch. phunsites.net. 60583	IN	NS	ns2.genotec.ch. phunsites.net. 60583	IN	NS	ns3.genotec.ch. phunsites.net. 60583	IN	NS	ns4.genotec.ch. ; <<>> DiG 9.6.0-APPLE-P2 <<>> A phunsites.net. That was very bizare. 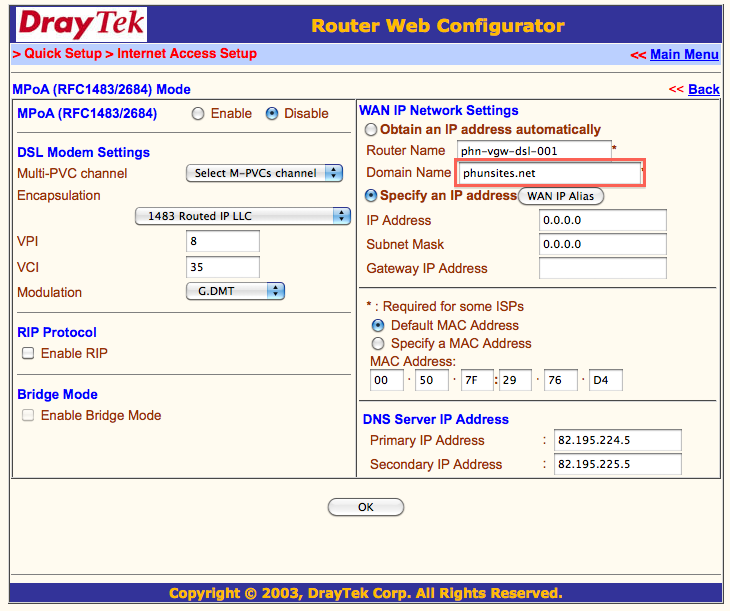 As it turned out, the DrayTek Vigor does DNS proxying by default. There's usually nothing too wrong about that, but in my case, it was pretty annoying, because the router seemed to inject it's own IP address for queries destined to its domain name. So my intent was to remove the domain name which I had earlier configured on the router GUI. Unfortunately that was not possible. Whenever I deleted my domain name it would show up again later on in the GUI, even after a reboot. So I gave it a shot through the Telnet CLI, where I tried to remove the domain name using this command "sys domainname clear". phunsites.net. 59427	IN	NS	ns2.genotec.ch. phunsites.net. 59427	IN	NS	ns1.genotec.ch. phunsites.net. 59427	IN	NS	ns3.genotec.ch. phunsites.net. 59427	IN	NS	ns4.genotec.ch. So to summarize: The DrayTek Vigor injects the "domain name suffix" as configure through the "sys domainname" command into the DNS proxy. This is very odd, as I would suppose, that it would do so only for the fully qualified domain name (FQDN), which would make perfectly sense then. 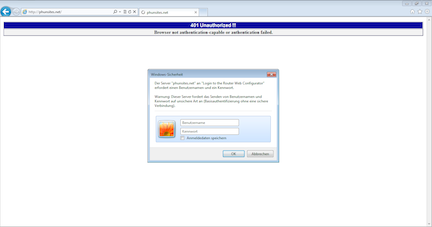 ; <<>> DiG 9.6.0-APPLE-P2 <<>> A phn-vgw-dsl-001.phunsites.net. I could live with this behaviour if I think that one would perhaps prefer to set a more memorizable FQDN for the device, let's say "router.phunsites.net", which would automagically appear even if no matching DNS recource records exist. However, it feels absolutely inappropriate for the DrayTek Vigor to inject a spoofed A resource record for the domain name suffix as well. This holds especially true when a matching resource record in the zone indeed already exists. As a IT professional I tend to always configure all settings properly on my devices. In this case, this attitude unconvered a very odd and in my opinion erronous behaviour. As there is no current firmware to fix this, there's only two ways to work around this: Either unconfigure the domain name as shown above through the "sys domainname clear" command or use a domain name suffix, that does not collide with a real domain name or FQDN. After all, this is surely no big deal, but a pitfall nevertheless. As DrayTek routers are still four to five times more expensive than the usually cheap home routers I wouldn't expect to see such misbehaviour.